We want to curate a snapshot of these genres, by screening ten new films (all produced in 2016/2017) and one restored classic film. As a small festival team with a limited budget and limited time, we cannot replace the large and multi-city Festival of German films as it ran from 2002-2016, but with our expertise, we can curate a festival that ties German culture and German cinema together, providing the audiences with a window into current societal, cultural and cinematic developments in Germany. Peter has been an integral part of the German Film Festival since 2002. His knowledge of German cinema is abundant and his experience with various film festivals in Melbourne invaluable. Peter is visiting the Munich Film Festival in June, where he will not only watch and source the newest German films but also live stream his experiences and meetings with German actors and filmmakers, to Melbourne. Irina is currently completing her PhD at the University of Melbourne in which she analysed the German Film Festival as a tool of German cultural diplomacy. In 2013-16 Irina has worked with the Goethe Institute in staging the German Film Festival as well as being involved in the German Film screenings as part of the German meet-up Kino. Marko studied business administration and international management in Munich. In 2014 Marko founded The German Meetup Kino Melbourne Group and he is also the organiser of another social German Meetup group. The German Meetup Kino Group hosted 17 screenings of German language films since then. 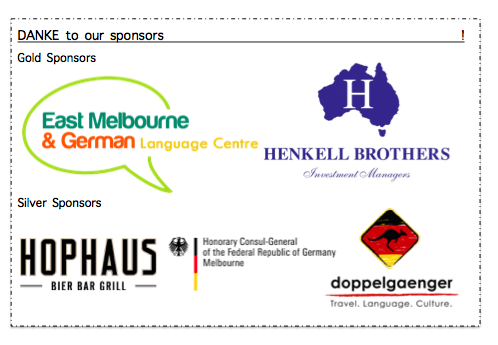 Marko has been part of the German community in Melbourne for over seven years. Marko works as Credit Analyst and his passion for German cinema -especially for DEFA films- his networks and business mindset are crucial to the success of German Cinema Melbourne. Daniela works as a German Academic Exchange Service (DAAD) lecturer and is therefore deeply involved in the diplomatic and educational community of Melbourne. Next to her work as a lecturer, Daniela is an artist, specialising in tattoo-art, street-art and exhibiting her paintings inspired by Mexican La Catrinas. Daniela’s creativity will be crucial in the curatorial process of the festival. Claudia is a film historian and filmmaker. One of her major works is the feature-length documentary, Películas escondidas. Claudia organised many film screenings and has inside knowledge of the legal and financial aspects of film screenings. Her first-hand knowledge as a filmmaker and immense knowledge on German film come in handy for the curating of German Cinema Melbourne.